Many of the plants we enjoy in our gardens produce flowers. We also enjoy many plants for their foliage, but the flowering plants, called angiosperms, are the ones that attract our attention. The angiosperms, which first developed about 245 million years ago, have grown to dominate the terrestrial ecosystems, exceeded only by the coniferous forests. There are about 260,000 species of angiosperms, and the growers of the most popular garden species have produced countless selections, hybrids and cultivars. When we visit our local garden centers or flip through catalogs of mail order plants, we see most often those variations of the most familiar plants. Some avid gardeners eagerly seek the latest introductions of roses, irises, petunias and other and take pleasure in being among the first in their communities to have the hybridizers’ newest achievements. Each year, when we might think that new versions of popular plants are not possible, we find unexpected colors, new color combinations, more vigorous or more floriferous producers, and plants that have been bred to be more resistant to pests and diseases. These new introductions are often the most costly plants offered, reflecting both their appeal to consumers and the costs of development and introduction. The most enthusiastic collectors of the best and latest do not flinch and gladly pay the premium prices. Gardeners who appreciate unfamiliar and interesting plants have alternatives to each year’s new crop of high-priced new introductions. The vast array of angiosperms includes many exotic, garden-worthy plants with gorgeous blossoms that are rarely seen in garden centers or catalogs, and are very much worth the time and attention of gardeners. The local gardener’s search for exotic flowers will be most successful when focused on plants that are well suited for the special growing conditions of the Monterey Bay area. These include plants from the world’s “summer-dry” climate regions, including coastal California, the central coast of Chile, the southwestern coast of Australia, South Africa and of course the Mediterranean basin. A wide selection of interesting plants is native to these areas, and will succeed in the Monterey Bay area with routine care. One example of an interesting exotic from a summer-dry climate is the Giant White Squill (Urginea maritima), which is a member of the Asparagus family (Asparagaceae). This plant, which is from the Mediterranean basin, has an enormous bulb (perhaps the largest of any plant), and an unusual annual cycle. It grows in the winter: large leaves appear from November to about May, when they yellow and dry, and the plant goes dormant. Then, in late July, it sends up a dramatic flower spike, up to five feet high. Each spike has a raceme of hundreds of tiny white or pinkish-red flowers. Click to enlarge. 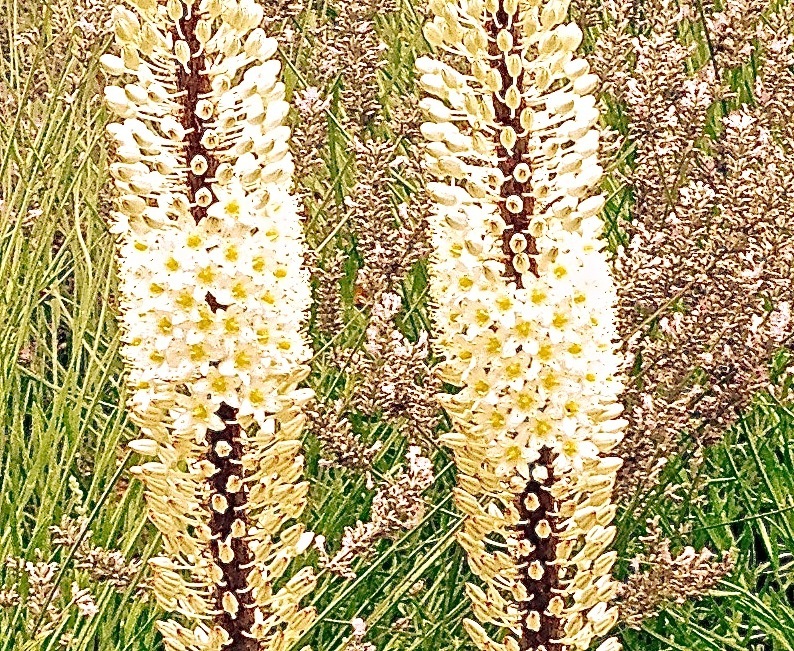 Click to Enlarge Unusual plants that will grow w ell in your climate, can add a good measure of interest to your garden. Watch for exotic selections in your garden center or garden catalogs. The Giant White Squill has interesting characteristics. The flower stalks will continue to blossom after being cut, so you could bring a stalk indoors to watch the progressive opening of the blossoms. For information about “uncommon and astonishing” plants, visit the website of Louis the Plant Geek. His website has information on many exotic plants, and includes photos of the Giant White Squill in leaf. Gardeners oriented to reading could look for the book, Bizarre Botanicals, by Larry Mellichamp and Paula Gross (Timber Press, 2010). It could be in your local public library or book store, and is currently available on Amazon.com. Wherever you find exotic plants for your garden, always favor plants that are suitable for your garden’s growing conditions. For most gardeners in the Monterey Bay area, remember that such plants are native to the Mediterranean climate region. Be horticulturally adventuresome while increasing your chances for success! 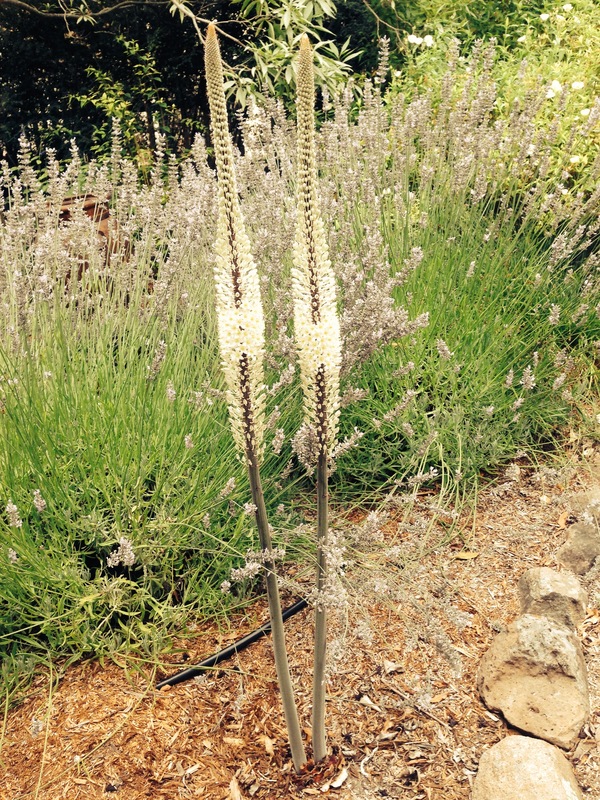 This entry was posted in Essays 2014, Summer Quarter and tagged Hybrids, Mediterranean Plants, Selection by tomkarwin. Bookmark the permalink.